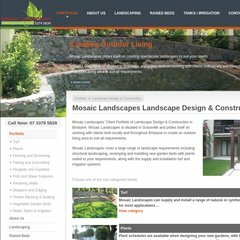 Topics: Mosaic Landscapes, Portfolio, Landscaping, Raised Beds, & Tanks / Irrigation. The programming language environment is PHP/5.2.17. It has 2 DNS records, ns2.suncoasthosting.com.au, & ns1.suncoasthosting.com.au. It is hosted by Theplanet.com Internet Services Inc (Texas, Houston,) using Apache/2 web server. PING (174.122.218.106) 56(84) bytes of data. A time of 26.9 ms, is recorded in a ping test.